Joburg has long been regarded as the Cinderella at the cultural ball, in the shadow of her more glamorous step-sister, Cape Town. However, the city has emerged during the last 20 years as a dynamic centre of cutting-edge arts activity, offering a whole range of art galleries catering to the tastes of cultural aficionados and different art buying markets. 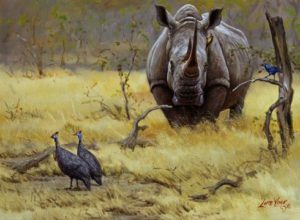 Many galleries in Johannesburg sell the traditionally safe subject matter of landscape, portrait/figure studies and still-life, to which can be added that ubiquitous South African genre: wild-life painting, all usually in an easily digestible figurative style. I have not mentioned the galleries that sell this kind of work, nor have I mentioned galleries which sell mass-produced curio art under the guise of ‘traditional tribal art’. and their support and promotion of emerging artists who often challenge the status quo. Across town in Auckland Park is the University of Johannesburg [UJ] Gallery. Wits Art Museum cnr Jorissen St and Jan Smuts in Braamfontein is one of the most exciting additions to the Joburg arts scene. With the Standard Bank as patron, Wits has built up a very fine holding of contemporary Southern African art as well as one of the best collections in the country of African art. These works are now showcased in rotating exhibitions in this wonderful new and contemporary space. The Standard Bank as a major sponsor of the arts has its own very impressive gallery space at its head office in Simmonds St., central Joburg. The Standard Bank Gallery has a dynamic cultural programme and has hosted retrospective exhibitions by major South African artists including Irma Stern, Gerard Sekoto, Alexis Preller, Cyprian Shilakoe, Simon Stone to name but a few. One of the most popular events is the annual exhibition by the incumbent winner of the coveted Standard Bank Young Artist of the Year Award. The gallery has also hosted exhibitions of significant 20th century European artists such as Chagall, Miro and in 2006, the Picasso and Africa exhibition. Also in central downtown Joburg but further to the east at 160 Main St lie the headquarters of another major bank: ABSA. Here in ABSA towers north, there is an impressive collection of site-specific works commissioned for the space when it was being built in 1999. The ABSA Gallery mounts changing exhibitions of contemporary Southern African art. 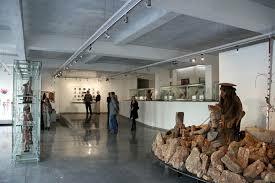 The UJ Art Gallery hosts 8 to 10 exhibitions annually and they arrange regular walk-abouts providing the viewer with better insight into the current exhibition. And finally there are two municipal museums which both have impressive collections but are in a parlous state due to a lack of financial resources, (funding from local government) and a paucity of skilled human resources. These are Museum Afrika in Newtown (which has an excellent cultural heritage collection) and the Johannesburg Art Gallery in Joubert Park. Tellingly, neither have functioning websites. Goodman Gallery was founded in 1966 by Linda Givon aiming to support and promote artists whose work was engaged and challenging. Initially functioning under the restrictions of Apartheid, Goodman’s stable of artists expressed themes of resistance and critical commentary on the status quo in South Africa. While in the post 1994 era, many of the ideas and narratives developed under the rubric of ‘art for advocacy’ have shifted, Goodman Gallery continues to support artists who challenge the current political, economic and social status quo. Brett Murray’s work The Spear, with all the controversy surrounding it is but one example. Goodman Gallery (now under the new ownership of Lisa Esser), focuses on artists from South Africa and the continent, as well as international artists whose work engages in a dialogue with the African context. 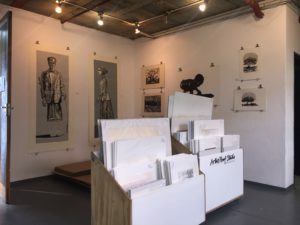 Goodman Gallery Projects at Arts on Main, the arts precinct in downtown Johannesburg, provides a platform for younger and emerging South African artists to exhibit, and for special projects and installations. Circa Gallery on Jellicoe In 2009, the Circa building was developed alongside the Everard Read gallery. The modern elliptical building designed by Pierre Swanepoel of StudioMAS Architects offers wonderful spaces to exhibit large contemporary works in the changing exhibition calendar. Gallery Momo in 7th Ave Parktown North represents international and locally based contemporary artists who produce challenging rigorous and thought–provoking work. David Krut Projects is an arts, design and projects space at 142 Jan Smuts Avenue. In addition to a changing exhibition programme there are prints on sale made by artists in the David Krut Print Workshop (DKW), a collaborative intaglio and monotype studio. Since 1997 Krut has been publishing monographs on South African artists under the TAXI art books series. These are on sale in the bookstore. David Krut has a satellite space at the Arts on Main complex. Lizamore Gallery is also part of what has become known as the Jan Smuts Art strip or Rosebank Art Mile. Established in 2001 by Teresa Lizamore, Lizamore & Associates gallery has been showing the work of new, as well as established contemporary South African artists for 15 years. Operating since 2008, their Mentorship programme sees artists given the invaluable opportunity to work under the mentorship of an established artist towards a solo exhibition. Also their SA Taxi Foundation Art Award was launched in 2014 for new artists to present designs to be translated as decals on minibus taxis. This is a double whammy – it takes art to the broader public and it gives a moving platform for up-and-coming artists. Stevenson Gallery in Juta St Braamfontein hosts exhibitions that engage with contemporary art practice in South Africa as well as Africa and its diaspora. They have also brought international artists to South Africa. Stevenson also has an active publication programme that includes catalogues for many of its exhibitions and artists. Juta Street has become another hub for smaller more cutting-edge galleries. Graham’s Fine Art Gallery is in Sandton at 68 on Hobart, Block A, Cnr. Hobart & Dover Road (Off William Nicol Drive). As its name suggests it is a very ‘Sandton’ Gallery aimed specifically at the wealthy who buy art for investment. It has a large and impressive range of works in the traditional media of painting and sculpture by the big names in South African art history from the early 20th century onwards as well as established contemporary artists. Have a meal at the Service Station before visiting Upstairs at Bamboo, a small gallery which has short exhibition runs of smaller scale works by usually lesser-known artists that are very reasonably priced. Artist Proof Studios founded by Kim Berman and Nhlanhla Xaba in 1991, is an Art Education Centre that specializes in printmaking. Located in the Bus Factory in President St Newtown, they hold regular exhibitions of their artists’ works which sell for very affordable prices. 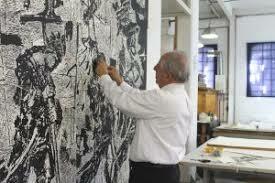 Several artists who trained at Artist’s Proof Studios have gone on to exhibit internationally. Spaza Gallery located at 19 Wilhemina Street, Troyeville is run by Andrew Lindsay who has livened up much of the inner city with his beautiful and accomplished mosaic work. 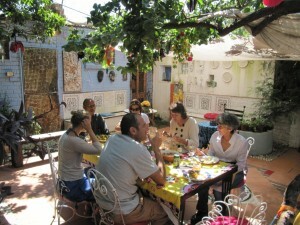 At Spaza a small low-key gallery and cultural space, you’ll find a range of art, jewellery, mosaic work etc. on offer and the best of all is to go for a Sunday lunch under the pergola in the charming little courtyard at the back of the house. 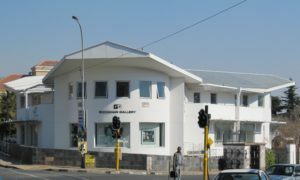 Among the various development projects that the Resolution Gallery (140 Jan Smuts Ave) supports are: MonkeyBiz, the Mapula Embroidery Project, and the internationally-renowned Ardmore Ceramic Studio. In Toto Gallery is a relative newcomer to the Joburg art scene. It offers a wide range of both local and international contemporary artists who tend to be less well-known. Another creative place where you can hang out and visit various small exhibition spaces is Arts on Main at the Maboneng precinct, 264 Fox St There’s also an outdoor cinema, a restaurant and fabulous rooftop bar which offers amazing views of Joburg. 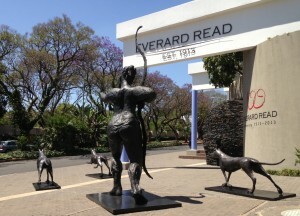 For those who are looking specifically for African artefacts the best place to go is Kim Sacks Gallery Parkwood. Kim Sacks established her gallery in 1986 and, in 1998, moved into the current adobe style building at 153 Jan Smuts Ave. With a keen aesthetic eye for the beautiful and being a teacher, ceramicist and collector herself, the gallery is filled with the most exquisite artefacts from all over Africa. The range includes both traditional and utilitarian objects as well as contemporary works made using traditional techniques. 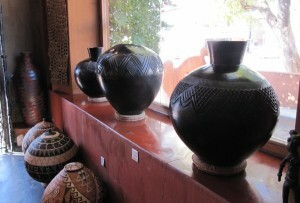 This gallery is the best place to buy stunningly beautiful African artefacts or simply just ogle with envy! Two other sources for African art which are not really galleries are a showroom in the case of Togu’na and a warehouse in the case of Amatuli . At Togu’na’s showroom in Parktown North you’ll find a wide range of objects sourced from all over Africa, from exquisitely hand crafted items to large sculptures and items of furniture. Amatuli has artefacts from Africa although here the selection is a bit more patchy – some real pot-boilers but with the occasional gem often in a bad state of repair.